There’s little doubt that change is afoot in Detroit. Go anywhere Downtown or Midtown and you’ll see it — the cranes and the construction workers, the scaffolding, and the buzz of power tools around every corner. It is an encouraging sign for the once-bankrupt city, but that progress also hides a significant issue: A bulk of this work is led by large firms that do not necessarily reflect Detroit’s racial and ethnic makeup. And those local, smaller developers who are trying to participate continue to face an uphill battle securing the capital they need. It’s this inequity that has inspired Capital Impact Partners to launch its first-ever Equitable Development Initiative (EDI), a program designed to build the capacity of minority developers to actively participate in and shape an inclusive growth strategy for Detroit. The program offers an opportunity for minority development professionals to come together and learn the ins and outs of local real estate development in Detroit, while growing their professional networks. 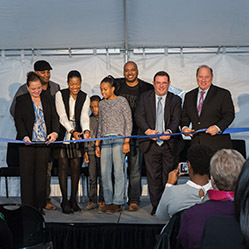 The hope is that by supporting and connecting these developers, the fruits of Detroit’s renaissance will be more equitably shared. The 2018 Equitable Development Initiative cohort offers a deep commitment to cultivating the ecosystem of professionals who are also people of color in Detroit’s real estate development industry. Each person in the initiative’s first-year cohort of 29 brings a diverse array of unique talents and backgrounds to the field. They also offer a deep commitment to cultivating the ecosystem of professionals who are also people of color in Detroit’s real estate development industry. These professionals are at the vanguard of change. As they develop their networks, portfolios, and practices in the real estate development space, they are carving out a new niche not only for themselves but the industry as a whole and the communities which they serve. Alisha Moss suspects she has building in her blood. That’s because her grandmother built all of the Lima, Ohio, houses Moss’ family lived in from the mid-1930s through the 1960s with “her bare hands,” according to Moss. Her grandmother did this in an era when few women, and few African Americans, were involved in the construction industry. Alisha Moss followed in the footsteps of her grandmother who built all of her family’s homes “with her bare hands” from the 1930s through the 1960s. Fast forward to 2018. While some things have improved, in many ways, they are the same. African Americans are still a minority in the construction industry, as are women. And you can see that in the kinds of projects getting developed in Detroit these days, according to Moss. And that, Moss says, is why cultivating minority developers at this time in Detroit’s resurgence is so critical — they are connected to the areas that need development the most. “If you have quality, effective minority developers, they will most likely be building and focusing on the minority and native Detroit population that has thus far been neglected,” she says. For Moss, it’s all about creating tools and systems for people to work together more efficiently, a philosophy she’s developed in her many years of industry experience. Alisha Moss believes that cultivating minority developers at this time in Detroit’s resurgence is so critical as they are connected to the areas that need development the most. After attending the University of Notre Dame, Moss went to work for Ford Motor Company and came up in the ranks of procurement, specializing in construction. In 2014, after 15 years on the corporate side as a buyer of engineering and construction services, Moss decided to leave the comfort of corporate America and launch her consulting venture, VM3 Consulting Corporation, offering consulting services to the construction industry. And so Moss’ grandmother’s blood began to stir once more. She went from wanting to help developers to starting down the path of becoming one herself. The first step on that path was moving from Chicago to Detroit in 2016, so Moss and her husband could be closer to her husband’s family as they raise their young son. The move also offered new professional opportunities. The next step was getting some projects under her belt, a task Moss found wasn’t so easy. And that’s where participating in Capital Impact’s Equitable Development Initiative comes in. In just her first month of training in the Equitable Development Initiative, Alisha Moss feels the network and resources she has been exposed to have allowed her to “get immersed in the developer market” in Detroit. “Every day my sphere is growing; my knowledge base is growing,” she notes. “In just the first month of training, I feel like I’ve been learning development for years,” says Moss. “The network and the resources have allowed me to get immersed in the developer market here. Every day my sphere is growing; my knowledge base is growing. Moss is a believer in paying it forward, in building a culture of collaboration and mentorship. She was recently elected the incoming president of the National Association of Black Women in Construction, and she participates in the National Association of Women in Construction. The area has maintained a relatively solid residential housing stock, even as commercial vacancies have climbed. But there aren’t many torn-down structures, so it still seems like a stable neighborhood. Chase has witnessed first-hand the lack of development plaguing many of Detroit’s neighborhoods — a gap that eventually inspired him to launch his own nonprofit focused on underserved areas of the city. A lack of development in Detroit neighborhoods was a common theme Cantrell came to observe. After law school at the University of Michigan, he worked as a corporate real estate attorney in two of Detroit’s large law firms. Most of the clients he served had real estate and corporate developments in the Downtown and Midtown areas. I’m hoping that, in the future, when I look out into the field in Detroit to find developers of color who look like the students in my class, that list is long. Thus far, Building Community Value has trained more than 100 Detroiters in the basics of small-scale development. Part of that training includes helping people figure out what the process entails, where to start in evaluating a project’s viability, building networks, and accessing resources and capital. “If you have a passion for it and you see a property in your neighborhood, and you’ve always wanted to do something with it, but you’re not connected to a community development organization or resources at the city level, you really don’t know where to start,” says Cantrell. Access to capital is a primary obstacle for new developers, especially minority developers. Building Community Value participants are a mix of community-based organization leaders, those who have never done development at all and don’t know much about real estate, and those who’ve done some small-scale development like a residential rehab. The participants reflect the city’s demographics: mostly African American and Latinos, and some Caucasians — with an age range from those in their 20s to those in their 70s. Cantrell points to several modest success stories, which include program participants who have purchased houses and rehabbed them before either living in them or renting them out. “These stories are happening in truly underserved neighborhoods around the city, in places where traditional developers aren’t going yet,” he explains. In addition to his work with Building Community Value, Cantrell consults with community development corporations who want commercial or mixed-use properties in their districts. He assists with the process of building a capital stack and teaches those corporations how to acquire a target property and move development forward. 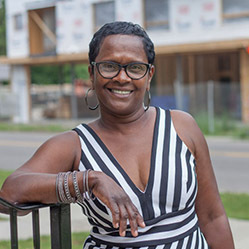 Cantrell hopes the Capital Impact’s Equitable Development Initiative program will help build a network of capable and connected development professionals who are also people of color and have a vested interest in developing Detroit’s neighborhoods for the benefit of Detroiters. Beyond merely increasing the numbers of competent developers of color, Cantrell also hopes programs like Building Community Value and Capital Impact’s Equitable Development Initiative can make an impact on the types of projects that get developed in the city of Detroit. Damion Ellis stands on the third floor of a dilapidated former adult foster care facility at 180 East Grand Boulevard in Detroit’s Island View neighborhood, just north of Belle Isle. The plaster walls peel around him as he steps over half-demolished boards; the only light available is what’s coming in through the window. Although the scene is bleak, Ellis has a vision. Although the scene is bleak in the dilapidated building in which he stands, Damian Ellis has a vision for transforming the eyesore into one of the city’s next big opportunities. What they’ll see instead, should Ellis’ vision come true, is an eight-unit, high-end apartment building with a combination of market rate and affordable housing. It’s one of several projects happening up and down East Grand Boulevard. Ellis sees this area as one of the next big opportunities in the city, and he’s thrilled to be a part of it. “We want to set the bar for what development should look like not only visually, but also regarding the opportunities we provide for the community through our development so that others can model their practices after ours,” he says. Born and raised in Detroit, Ellis attended the University of Detroit Jesuit High School and graduated from Howard University. Upon graduation, he went to New York to work on Wall Street, with stints at Goldman Sachs and JPMorgan, where he sold repackaged leveraged loans to large institutional investors. In 2010, he decided to come back home as the city struggled through its post-recession financial crisis. Where some saw despair, Ellis saw opportunity. 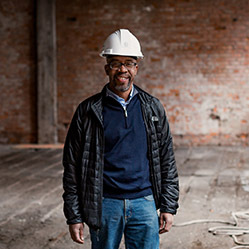 Back in Detroit, Ellis gained experience in construction with a consulting company hired by Detroit Public Schools to build and renovate 18 schools across the district. After that, he worked for General Motors before deciding to start his real estate development venture, Phoenix Real Estate Company, with two of his childhood friends. Ellis handles finances for the company. Jelani Karamoko, a real estate lawyer, oversees the legal work. Brandon Greer, a sports agent, is in charge of business management and fundraising. For the past year, the trio has been buying and selling mostly single-family homes, but they now have a few multi-family redevelopment projects in the works. The project at 180 East Grand Boulevard represents a new level of investment for the company, and their team is in talks with Capital Impact Partners to support the project’s financing. Ellis sees Capital Impact’s Equitable Development Initiative as critical for inspiring potential developers of color to pursue careers in the industry. Born and raised in Detroit, Damian Ellis eventually moved to New York City to begin his career. In 2010, he decided to come back home as the city struggled through its post-recession financial crisis. Where some saw despair, Ellis saw opportunity. Beyond offering a model for would-be developers, Ellis sees the Capital Impact program as one way to help build up the development supply chain around people of color within the city of Detroit. Beyond offering a model for would-be developers, Damian Ellis sees the Equitable Development Initiative as one way to help build up the development supply chain around people of color within the city of Detroit. It’s an area where Ellis and his partners feel personal responsibility. “As African Americans who have grown up and lived in these communities — who know those who live there — we have more insight into the local needs. That insight helps ensure our development efforts meet those needs and are inclusive,” says Ellis. But Ellis also sees a responsibility to create opportunities.